Hundreds of anti-fascist protesters prevented a far-right group, Frontline Patriots (FP), from moving more than a few yards from the entrance of Liverpool Moorfields train station. 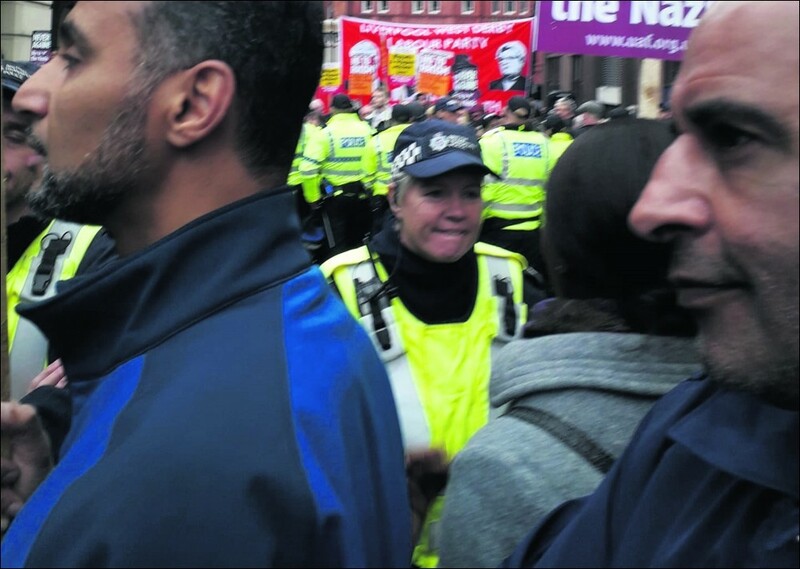 People from students to pensioners were determined that these racists would not achieve their twin objectives of holding a march followed by a rally in the city centre on 3 November. The police initially divided the protesters into two groups in an attempt to create a passage for the pathetic six or so FP members who turned up and to allow them to proceed with their plans. But the sheer numbers of protesters stopped this. Cheers and jeers went up as the police escorted the FP back into the station. But the episode did not end there. Word quickly got round that the FP were attempting to leave the station by a second exit several streets away. This exit is normally only open on weekdays, so it is difficult to believe that the police were not involved in the decision to open it on a Saturday. However, the protesters managed to get to this entrance in time, and in such force as to prevent the FP from getting into the city centre via this route. After a standoff for about an hour, the police eventually abandoned any attempt to get the FP away from the station, and ensured that they got onto trains and left. Tories out - we need socialism!